I thought I would take the opportunity to give a brief update on the ET-732 after some intense usage. There are still a number of small issues with the unit but my recommendation stays the same, still one of the best wireless probes on the market. - The probes, whilst can cope with higher temps have proven to be a little more delicate than the ET-73's. Best to get a spare set (about $20) and dont allow these cables to be pinched by your smokers covers. I was lucky enough to be able to source one of the new Maverick ET-732's. This is only due to be released in the new year, but my new chums at 5-0 BBQ (or their facebook page) in the states were kind enough to arrange for a unit to be delivered to me while I was in Philadelphia. I was itching to test out the new unit (which is a replacement to my aging and now well damaged Maverick ET-73) and the opportunity presented itself whilst I was in Toronto on an original Bradley electric smoker. I tested it on a full smoker of Ribs and chicken wings in -5°C (+- 20°F). The Bradley struggled in the cool weather but did a sterling job. It was easy to sync the units and even easier to get them up and running. 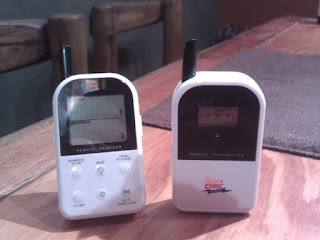 On first glance the unit is remarkably similar to the original units, however, they now sport a nifty aerial which allows for greater wireless distance (I tested to about 150 feet, line of sight, with no issues. The max distance is around 300 feet). The next noticeable difference are the waterproof buttons which addresses the biggest gripe about the original ET-73. 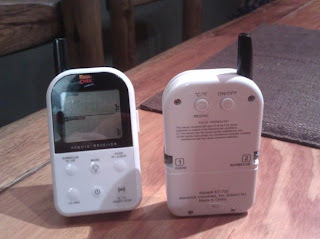 Both remote transmitter and the remote receiver have waterproof external (yes, no more pulling the battery component off the the transmitter) buttons. I have not had time to review all the software features, but it seems like its the same as the original unit. The probes have been uprated to support in excess of 600°F (which is about 200°F more than the original probles). The Remote Transmitter has the nifty clip and now has the prob mounts on the side of the unit rather than the back. On the whole (and after first usage) this is a worthy replacement to the original ET-73.